Koehler Funeral Home was founded in 1895. Over the years we have been dedicated to families we are privileged to serve. It is in this dedication and service that we annually recognize a community member for “Enduring Service”. This award may be obtained by any community member for their continued or enduring service. Teacher, clergy, Dr., nurse, hospice, coach, etc. The award comes with a certificate of acomplishment and contribution to the charity of the recipients choice. 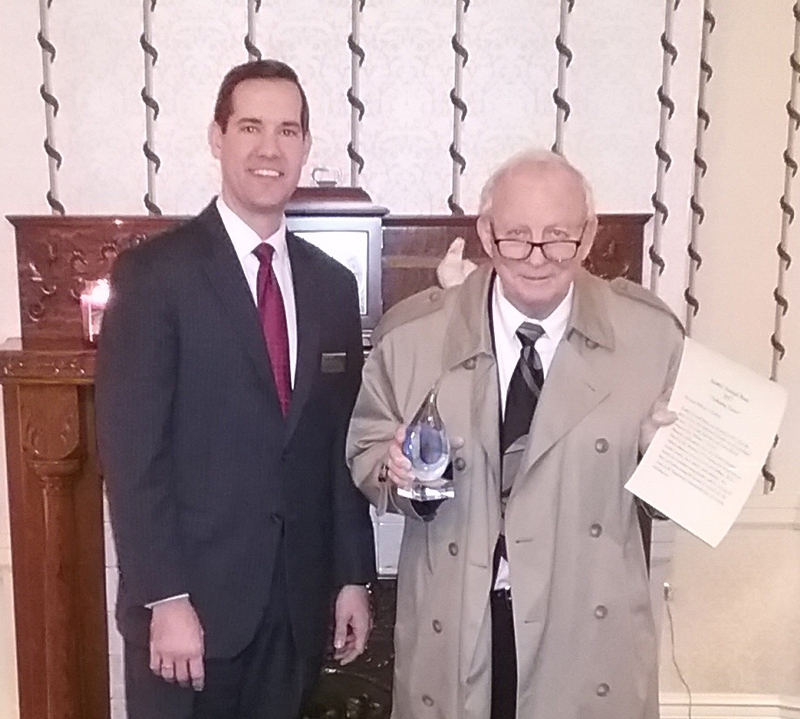 Evan Thayer and the Koehler Funeral Home team are proud to announce that Reverend Bill Tennyson is the recipient of the 2018 Enduring Service Award. Koehler Funeral Home was founded in 1895 and over the years we have been dedicated to families we are privileged to serve. It is in this dedication and service that we recognize Rev. Bill Tennyson. Bill has been the pastor at Mt. Gilead General Baptist Church in Boonville IN since November 2015, he is a devoted family man and has been an asset to our community. Bill was raised in Boonville and attended Boonville High School, and then went on to Fort Wayne Bible College (Taylor University) in Fort Wayne, Indiana. He was in the US Army National Guard during Desert Storm and has been married to his beautiful wife, Carolyn for almost 18 years. Bill along with his church have numerous outreach events planned with the next one being a movie night featuring “King’s Faith” on Sunday January 27th at 6 PM. He is an example of how we all should serve each other by showing kindness and generosity to everyone. The way Bill quietly leads is inspiring and gently shares his faith as he interacts with everybody. He has conducted funeral services for families who are not connected to a specific ministry and is always helping behind the scenes by showing patience and compassion. Bill has assisted us serve many families over the years with genuine empathy and kind-heartedness. We have the utmost respect and are blessed to have a dedicated man like Pastor Bill Tennyson among us! Koehler Funeral Home was founded in 1895. Over the years we have been dedicated to families we are privileged to serve. It is in this dedication and service that we recognize Rev. William L. Carlisle. Along his walk with the Lord, Rev. Carlisle founded Bread of Life Ministry in 1973 having now served over one million individuals in need of food and clothing. He has touched countless lives with his radio ministry. Rev. Carlisle has comforted many families with his message of hope and healing during the funeral of a loved one. His service to the community and Kingdom has impacted the lives of so many including ours.